CHEESUS WAS HERE by Pitch Wars mentor, J.C Davis … new release! Nothing ever happens in tiny Clemency, Texas, until the day a gas clerk finds the image of Baby Jesus inside a Babybel cheese wheel. When more crazy miracles turn up, Clemency turns into a full blown media circus. While everyone else seems ready to accept that God has a dairy fetish, 16-year-old Delaney Delgado hasn’t believed in miracles since her kid sister died. Del’s determined to prove this whole thing is one big hoax and nothing and no one is going to convince her otherwise. Sure her best friend, Gabe, is a pastor’s kid and on the side of the angels, but even Gabe has to admit things look a bit fishy. When Del finds proof the miracles are fake, however, she has to decide whether to disgrace her town and risk losing Gabe’s friendship or support a lie that mocks the miracle her family prayed for and never received. As a child, J.C. Davis spent her days inventing secret worlds and finding forgotten places. Busy reading her way through the local library, she never imagined writing books of her own until one day, all grown up, she fell in love with a children’s book and decided to rediscover a few of those secret worlds she’d invented. Ms. Davis’s first book is locked in a drawer guarded by attack trolls. Her second, CHEESUS WAS HERE, will be released in Spring 2017 by Sky Pony Press. 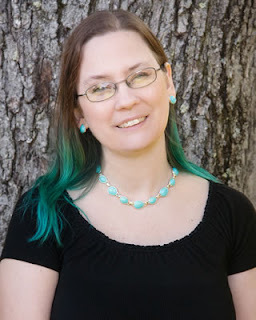 A programmer by day, Ms. Davis lives in Dallas, Texas, with her husband, two kids and a pair of hedgehogs with nerdy names. Ms. Davis is an amateur photographer, runs a Harry Potter meet-up group, and is an unrepentant book addict.